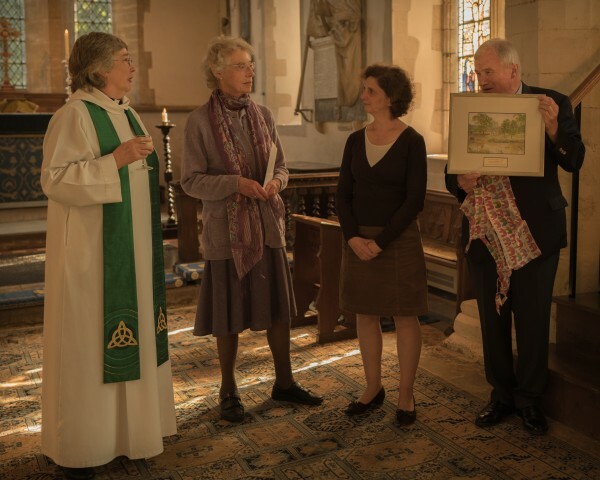 The congregation bade a sad goodbye to Stuart Fox and Jane Elliott on 24th September, as they attended a last service in Madingley before moving to their new home. They have made a huge contribution to the life of our church – Stuart as church warden, health and safety officer, Deanery Synod representative, reader, tea and bonfire maker and Jane as our very efficient treasurer, gift aid officer and reader … and so much more. We wish them every happiness and hope that they will call in to see us when they are able. The PCC is delighted to announce that Jo Wallace-Hadrill has agreed to serve alongside Elizabeth Seale as Church Warden. Jo lives in Madingley and has been a member of the Parochial Church Council and on the West End Development Fund Raising Committee for two years as well as taking her turn on the sides person’s, flower arranging and cleaning rotas. Jo’s musical talents are much appreciated and she regularly brings her harp to church as part of our services. Jo also plays at weddings and local venues. She has donated all the fees earned from these events to the West End Development Appeal for which we are truly grateful. We are thrilled to welcome Jo as our new warden.